The nature of virtualization means that hosting several different guest virtual servers running everything from Windows to Linux to custom appliances is not only possible but so much easier than on bare metal. It also means that the ability to centralize backup at the host level is going to be possible. A virtualization backup solution is ideally going to be host based. The previous article discussed the problems with cost and management of maintaining guest-based backup solutions. Licensing and support costs negatively impacted return on investment (ROI) for guest-based solutions. Host-based virtualization backups offer a tremendous benefit in being able to provide consistent images without the need to "touch" the guest servers. Ideally, a solution designed for virtualization should have the same feature-richness associated with an image-based backup solution for physical servers, plus direct integration with the virtual platform to take highest advantage of it with the least processing and administrative overhead. There are several must-have features when looking into virtual server backups. These can mean the difference between just surviving a disaster and thriving during it. 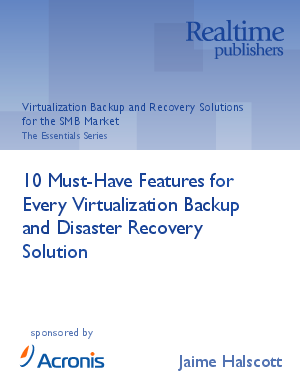 Consider the following ten must-have features when looking for a solution to back up virtual infrastructures.